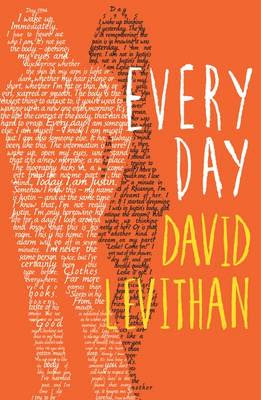 This is the first book of David Levithan’s I have read ( apart from Will Greyson Will Greyson, which I really enjoyed) and I must admit that I am a newfound fan of his. Everyday is unlike anyother book I’ve read. The narrative follows A , a drifter who wakes up in a different body every day. this plot may sound insane, and Levithan never explains how A came to be, but A does explain his backstory pretty well about halfway through the book. For the purpose of this review I’m going to call A a he, because that’s how I pictured him as I read the book, and also because they call him a he in the blurb. But despite this Levithan intentionally makes A gender neutral, which I found really difficult to get my head around, but gave a really interesting and philosophical dimension to the book. A lives in both female and male bodies, and is attracted to both males and females. A falls in love with Rhiannon, not because she’s a girl but because he just loves her ( if that makes sense, Levithan does a better job of explaining in the book, that is why he’s the professional writer, not me). This seems to be Levithan’s style, to identify love as a connection between souls, regardless of the bodies we come in. Apart from the extremely interesting gender-study-thing , Levithan actually wrote a really captivating plot. It was a real pageturner, I read it in one sitting in about 2-3 hours. It’s a really easy read, and even though the plot seems quite complicated it was really easy to follow and I never got lost. I really cared about A and hoped that everything would work out for him ( will it? no spoilers ). Levithan treats his characters in a similarly clear way. There are four or five recurring characters, but apart from those all the characters are replaced everyday. Despite this Levithan manages to create unigue characters with there own clear voice, all types of personalities from all walks of life. Justin, Rhiannon’s …. unsavory…. boyfriend is a character that could have been drawn badly, but Levithan cleverly manages avoid this and paints Justin as not-a-complete-jerk. I know personally that there are too many novels that leave the reader screaming ‘why are you still with him, he’s an idiot’ at the heroine but this is not one. Levithan makes it clear why Rhiannon stays with Justin, which is refreshing. Overall I really interesting read and would recommend it to anyone who likes John Green style YA fiction.